If you have a Nintendo Wii, Wii Sports and some overly enthusiastic players of this fun game, you most likely have had some minor (or major) injuries when Susan got a little too much “oomph” in her backswing in Tennis. Or that time when Timmy got a bit too excited when he hit that triple in Baseball. Lest we forget, Danny will never be the same after Carol caught him in the nether-regions after teeing off on a Par 3 in Golf. Also included is a bonus cooling fan for your Wii to keep it from overheating. I love these peripherals for the Wii Remote. 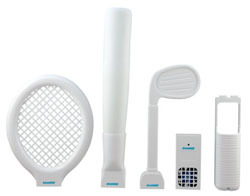 Like having an actual tennis racket extension is going to help your game in Wii Tennis. But, with every new gadget and extension for the Wii and the Wii Remote, I’m amazed with the imagination involved to bring these things to life. You can buy this kit from dreamGEAR for $34.99.